Mintex’s motorsport legacy stems back to the early years of Le Mans including helping the “Bentley Boys” secure all five of their victories during the 1920s and 1930s. 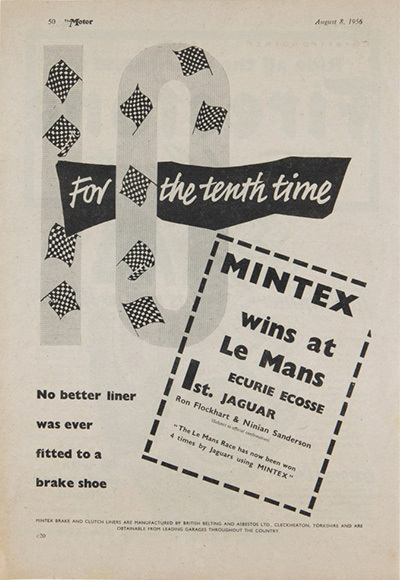 Mintex’s links with Le Mans continued in 1937 and 1939, braking the Bugatti Type 57G to victory in successive races, the 1938 race being cancelled due to industrial action. 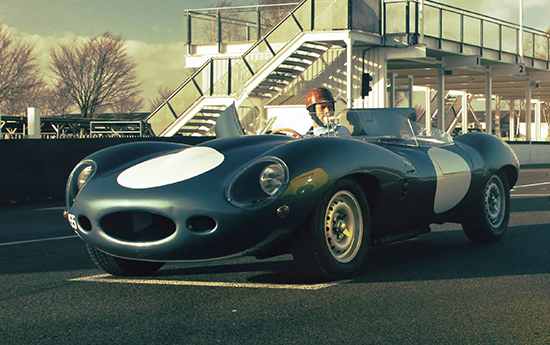 The company helped Jaguar during its successful era of dominance in the 1950s, which began with a victory in 1951 with its classic C-Type. 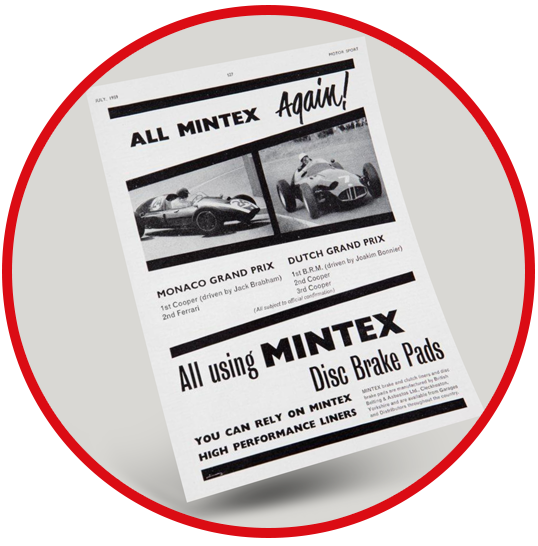 Mintex followed this up by creating a revolutionary and innovative disc brake, a Mintex Brake Pad in a Dunlop caliper, which proved to be a huge success, helping Jaguar to a total of five Le Mans victories between 1951-1957. 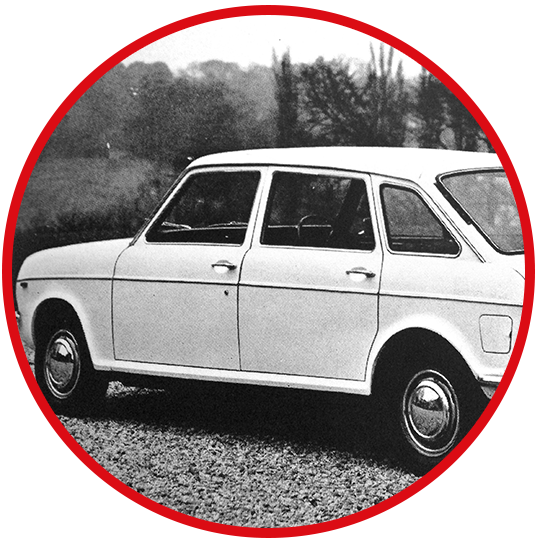 The pioneering disc brakes progressively became standard fitment on all cars from the late 1950s to the present day. 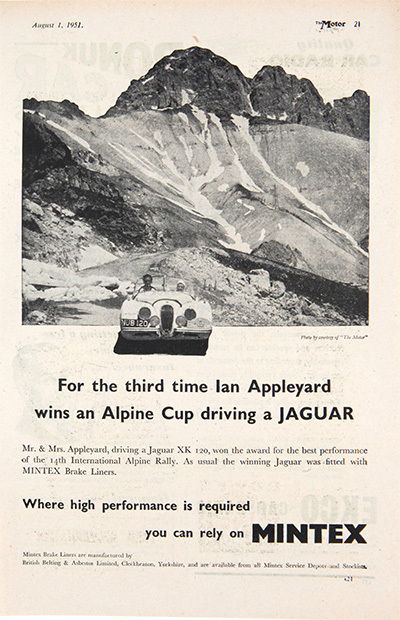 During Ecurie Ecosse’s 1956 Le Mans campaign, the Scottish-based racing team used Mintex on its Jaguar D-type. Driven by Scottish drivers, Ron Flockhart and Ninian Sanderson, Ecurie Ecosse won the race by just one lap, defeating the Mintex braked Aston Martin team which was driven by Peter Collins and Stirling Moss. The 1956 triumph was Ecurie Ecosse’s first in Le Mans, but it wasn’t to be its last. The 1957 Le Mans race will be remembered for Jaguar’s unrivalled dominance, with five D-Types taking the top six spots, an unparalleled record at the time. Yet again it was Ecurie Ecosse which took the victory, beating its secondary team by eight laps. Driven once again by Ron Flockhart and partnered by Ivor Bueb, the Scottish team secured its second victory in consecutive years. 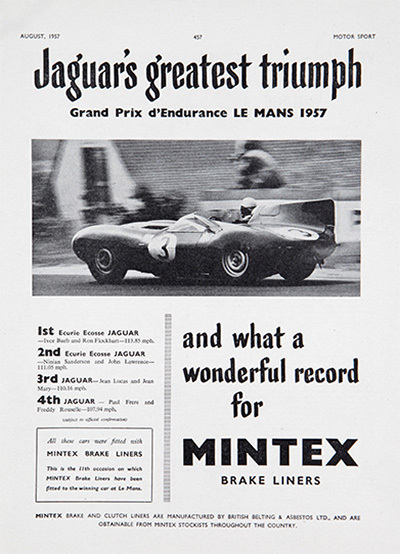 The triumph in 1957 ensured Jaguar its fifth Le Mans win in seven years, and gave Mintex its 11th success since Le Mans inauguration in 1923. During 1961’s Tourist Trophy race at Goodwood, and against a field of skilled drivers that included Jim Clark and his Aston Martin DB4GT Zagato, Stirling Moss and Mike Parkes raced Ferrari 250 GTs to 1st and 2nd place respectively. The win was Stirling’s 7th and final Tourist Trophy and his 4th in four consecutive years at Goodwood Circuit. 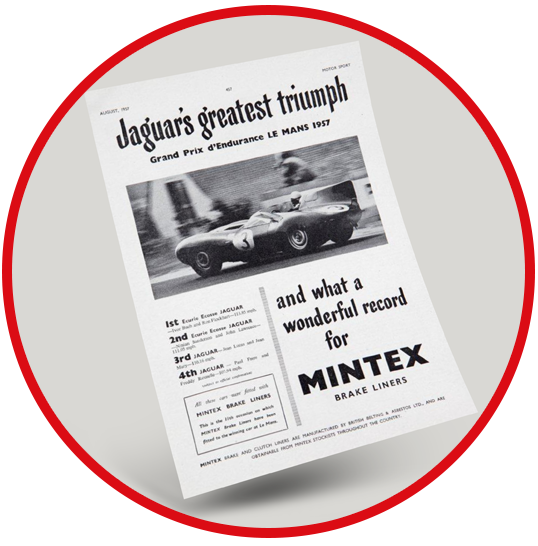 To date Mintex has helped aid famous marques to more than 30 victories, while securing a significant number of other victories and podiums throughout the 92-year history, proving there’s no other substitute of class in endurance racing. 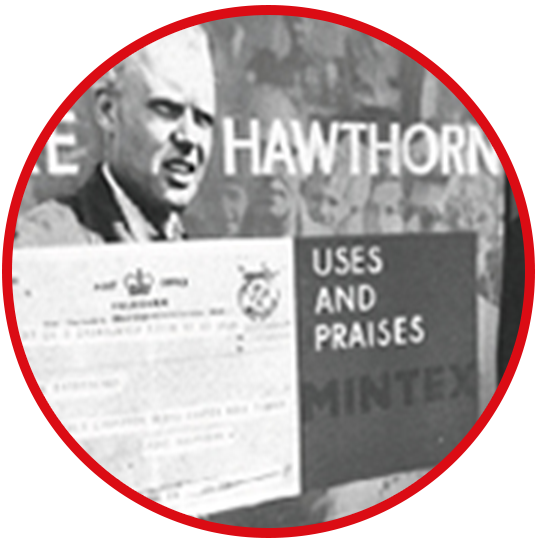 With a strong heritage and many notable achievements since 1908, Mintex has consistently demonstrated a commitment to ongoing product development. 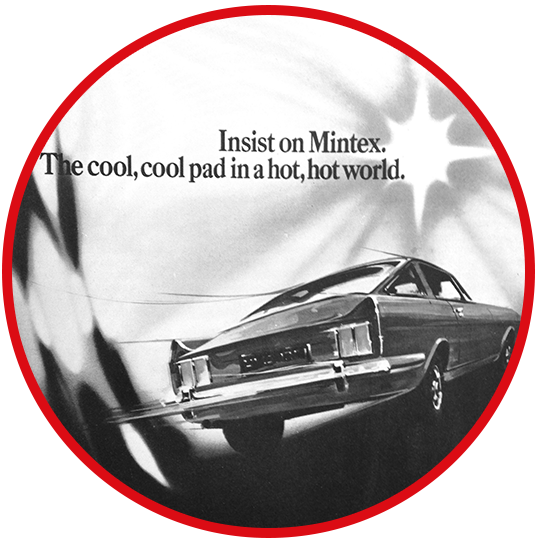 A philosophy that exists today and helps Mintex classic car brakes stay ahead of the competition. Hats off again to Jaguar for another outstanding performance at Le Mans. 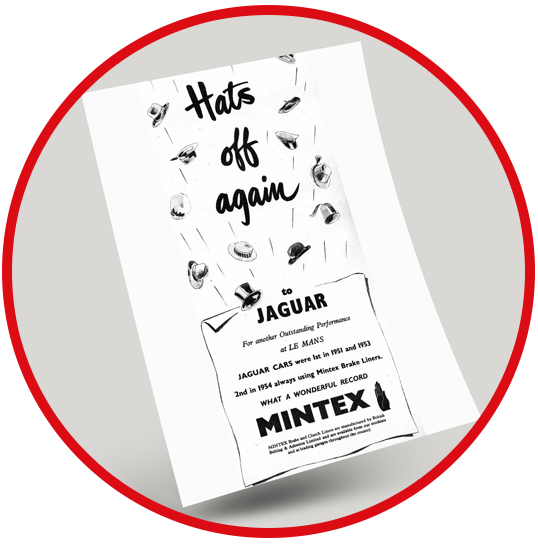 Jaguar Cars were 1st in 1951 and 1953 – 2nd in 1954 always using Mintex Brake Liners. 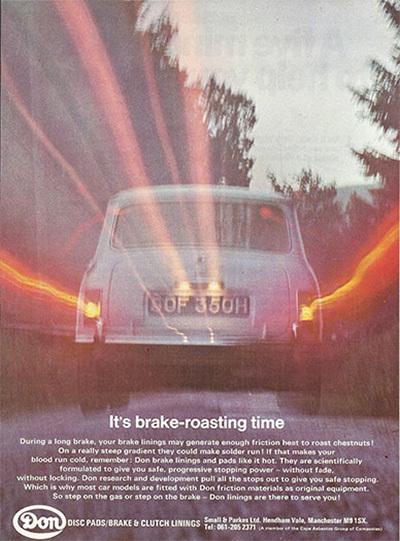 Mintex disc brake pads are fitted as original equipment on the new Vauxhall Victor, VX4/90 and Ventura. 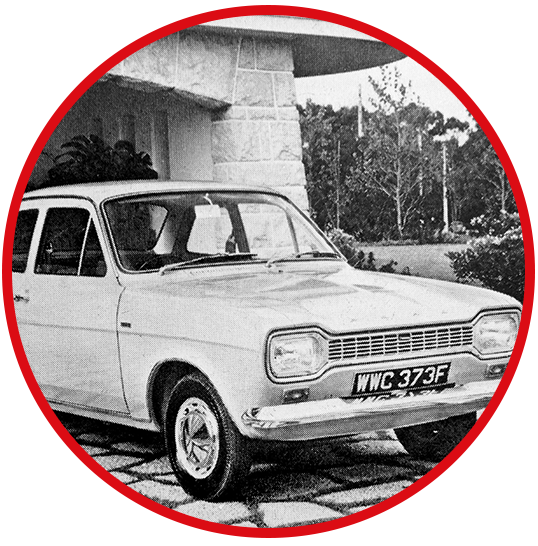 Over the years, Mintex has enjoyed a strong relationship with the legendary Jack Brabham, becoming a true partner in braking the racing team’s cars. Originally from Australia, Jack Brabham made his move into racing with a car known in his home country as The Redex Special, a Cooper-Bristol FII car that came with Mintex brakes. 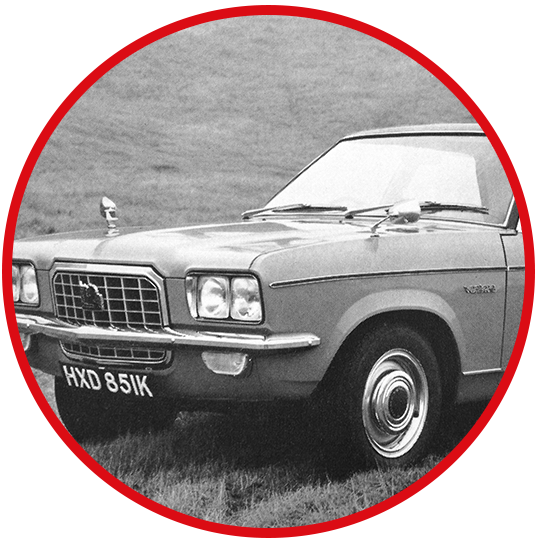 From his very first step on British soil, Jack remained loyal to the brand, and used Mintex liners throughout his career to retirement in the 1970s. 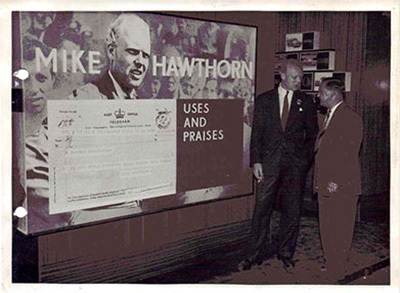 He also recommended the brand’s friction materials to The Kangaroo Stable, a group of Australian racing enthusiasts of which Jack was a member. 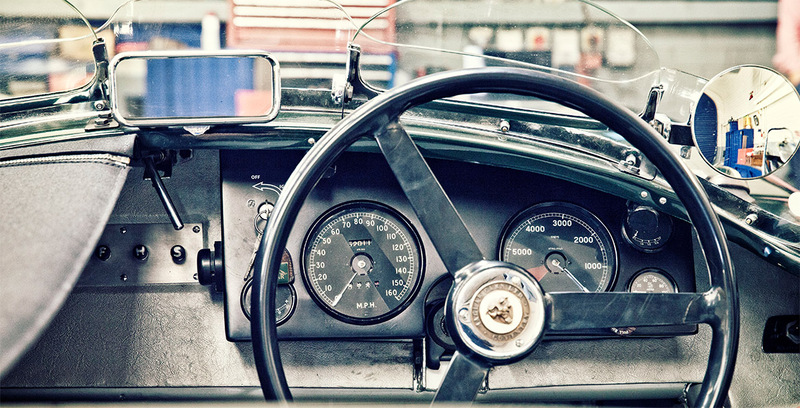 The group left Australia for England in the 1950s when they bought the Aston Martin DB3S in a proposed attack on European racing, and used Mintex liners throughout the tour, which was unfortunately cut short by the Le Mans disaster. 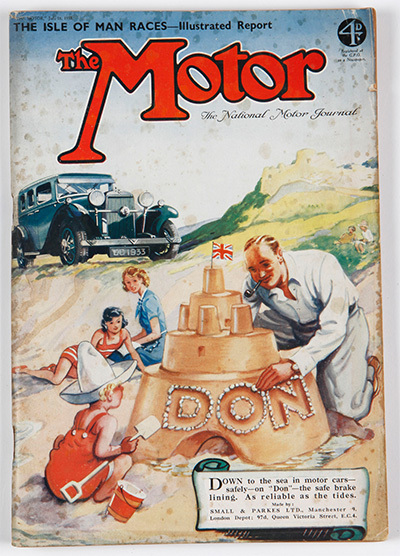 Through Jack, Mintex employee Lionel Clegg made certain that the group was supplied with Mintex friction materials. Unsurprisingly, Jack used Mintex brakes for the world championships, winning the race in a Cooper T53. 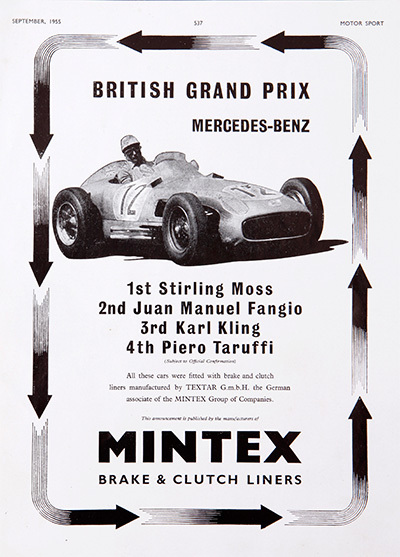 It is longstanding partnerships such as this that upholds Mintex’s pristine reputation for superb braking technology, with quality and innovation surrounding the brand to this day. With more than 90 years of race-winning experience, Mintex’s motorsport legacy stems back to the early years of Le Mans including helping the “Bentley Boys” secure all five of their victories during the 1920s and 1930s. 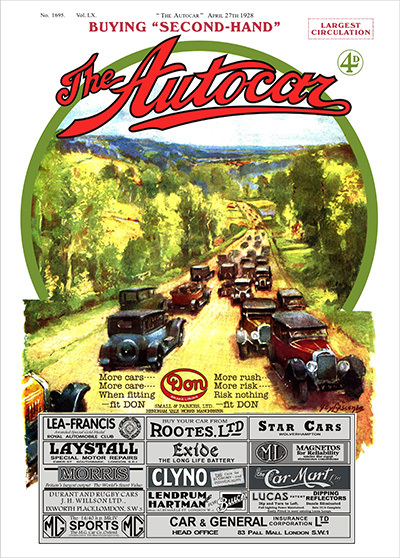 Here are a selection of historic adverts which showcase some of the many victories over the years. Today, we’re proud to share our expertise and products with millions of drivers across the world. 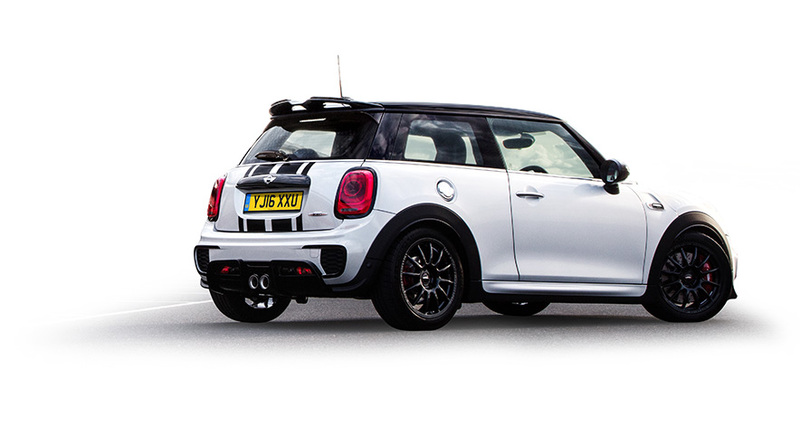 From Superminis to SUVs, we’re the name behind the brakes keeping families and motorsport champions safe every day.